If you are restoring an MV and looking for parts, just looking for parts to get and/or keep your MV running, want to have an MV restored, or are looking to buy a “project” jeep or a restored jeep; you have come to the right place! Featuring replacement bodies and accessories for MB/GPW, M38/A1 and CJ2, 3 & 5! We have been selling and installing these bodies on our restorations for over 10 years. Our customers benefit from our years of experience in working with the product. Our body kits come complete with many extras that other dealers do not offer. We provide a large supply of parts for the M422/M422A1 Mighty-Mite, M38/M38A1, MB/GPW and M151 jeeps, as well as parts for CJ2A, CJ3A, CJ3B and CJ5 up to 1975. Daryl Bensinger graduated from Shippensburg State College in 1978 with a Bachelor of Science degree in Business Administration. He then worked two years as a line supervisor at Hamilton Technology, in Lancaster, PA. There he supervised the manufacture of M577 Howizer fuses and Rockeye cluster bomb fuses. He also worked for farm machinery manufacturer, New Holland Machine Company in New Holland, PA, for 12 years. Daryl and his wife, Lida, have been self-employed in the military vehicle parts and restoration business since 1992 after dabbling in it on the side for the previous 15 years. Daryl became a member of the MVCC (Military Vehicle Collector’s Club) in 1976, membership # 443. The club went through some changes and is now the MVPA (Military Vehicle Preservation Association) of which Daryl is a life member. He is also member of the MVT (Military Vehicle Trust in England) and several local US MVPA chapters. He is a life member of the NRA (National Rifle Association). Daryl belongs to the Caernarvon Township Memorial Society and is a volunteer and life member of the Caernarvon Fire Company, both located in Churchtown, PA.
Other memberships include the Lanchester Hunting Club, the New Holland Rifle and Pistol Club and the Elverson Rifle and Pistol Club. Daryl is a technical advisor to the MVPA and has contributed to the Tech Talk Column with articles about the Mighty-Mite (M422, M422A1). Daryl had an article “M38A1, Daryl Bensinger rebuilds this classy post war Jeep” published in Windscreen Magazine. Windscreen is published by the MVT (Military Vehicle Trust) based in the United Kingdom. 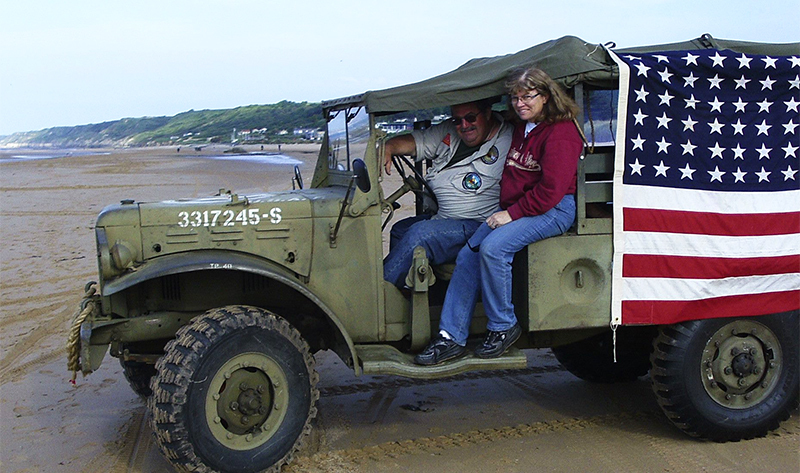 Lida has had an article entitled “Normandy, a Wife’s Perspective” published in Army Motors Magazine and contributed photos for an article on the Route 66 Convoy in the UK publication Classic Military Vehicle. Daryl’s 2 ½ ton GMC CCKW was driven by Daryl and featured, along with other GMC’s from the MVPA’s Red Ball Chapter, in the Discovery Channel documentary entitled “Machines That Won the War.” This program was based upon a quote by Gen. Eisenhower stating that the machines that won the war were the DC3 airplane, the bulldozer, the Higgins landing craft and the 2 1/2 ton truck. D&L Bensinger was chosen to supply the jeep in the D-Day glider landing display in the National WWII Museum in New Orleans. See pictures in our gallery. An article about D&L Bensinger was published in the May/June 1999 issue of Self-Employed America, a magazine published by the National Association for the Self-Employed. Daryl has also been mentioned as a source for parts in several articles published in Jp Magazine. In 1998, Daryl was awarded the Expert Driver Pin from the MVPA in the 2 1/2 ton truck class. More recently he was awarded the Expert Driver Pin for the ¼ ton Jeep and ¾ ton Dodge. In the “hobby” days, at the MVPA Convention in Lowell, MA, Daryl was awarded 1st place in Mighty-Mite category, 2nd place for Viet Nam era, and Special Mention for the entire show, all for the restoration of his M422 Mighty-Mite. Daryl and Lida, along with their 4 children, have attended many MVPA International Conventions and local shows. These events haven’t just been business, but also a lot of fun. After getting to know their customers and other dealers, the shows are more like “family reunions” which they all look forward to. Their granddaughters can even be spotted at shows sometimes! All four of their children have been to Normandy for D-Day anniversaries with Daryl and Lida, who have also attended the War and Peace show in England. Daryl and Lida have participated in three cross-country convoys with the MVPA and some shorter convoys with local groups.